Today, scientists led by Stephen Hawking are using high-tech scanners to discover if a huge, cigar-shaped ‘comet’ is in fact, an alien probe. Now, one astronomer claims that the space rock, named Oumuamua, could be an alien spacecraft with broken engines that is tumbling through our solar system. Dr Jason Wright from Penn State University suggests that a broken alien spacecraft move in exactly the same way as the interstellar comet. Oumuamua is about a quarter of a mile long, 260ft wide and currently travelling at 196,000mph. Rather than moving through space like other space rocks, astronomers believe that it is ‘tumbling’ through our solar system. Writing in his blog, Dr Wright, an associate professor of astronomy and astrophysics at Penn State University, says: ‘Such derelict craft would, if they are not travelling so fast that they escape the Galaxy, eventually ‘thermalize’ with the stars and end up drifting around like any other interstellar comet or asteroid. Dr Wright suggests that the object could be a ‘Von Neumann probe’ – a theoretical self-replicating spacecraft that visits star systems. Dr Wright previously suggested the mysterious dimming of star KIC 8462852 – also known as Tabby’s Star – could be caused by an alien megastructure called a Dyson Sphere. His latest comments come ahead of a project later today in which scientists will use high-tech scanners to discover if Oumuamua was sent by an alien civilisation. A cigar-shaped comet named ‘Oumuamua sailed past Earth last month and is the first interstellar object seen in the solar system. It was first spotted by a telescope in Hawaii on 18 October, and was observed 34 separate times in the following week. 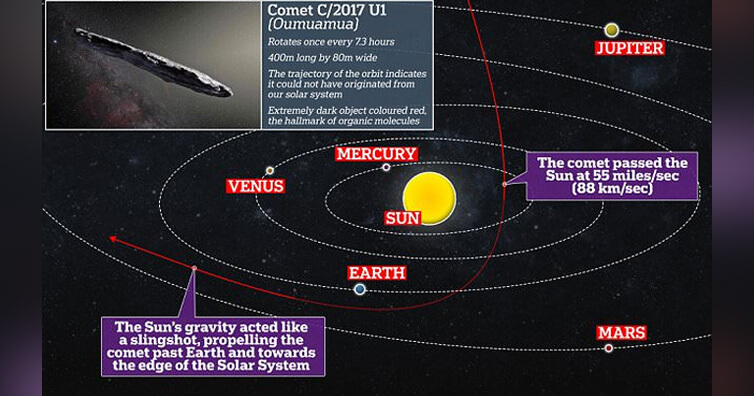 Travelling at 44 kilometres per second (27 miles per second), the comet is headed away from the Earth and Sun on its way out of the solar system. The comet is up to one-quarter mile (400 meters) long and highly-elongated – perhaps 10 times as long as it is wide. But the comet’s slightly red hue — specifically pale pink — and varying brightness are remarkably similar to objects in our own solar system. The team of scientists, called Breakthrough Listen, will use the world’s largest directable radio telescope, at Green Bank in West Virginia, to follow it for ten hours today at 3pm ET (8pm GMT). They are listening for electromagnetic signals, no stronger than those emitted by a mobile phone, that cannot be produced by natural celestial bodies. If they find them, it would be proof that extraterrestrial forces really could be at play. For the moment, they are trying to contain their excitement. But the name they have given this bizarre object betrays their optimism. Oumuamua is a Hawaiian term meaning ‘a messenger from afar arriving first’. Another oddity is that Oumuamua is flying very ‘cleanly’, without emitting the usual cloud of space dust that astronomers observe around asteroids. It was first detected on October 19 by a long-running research programme called Pan-STARRS, which uses powerful telescopes to photograph and monitor the night sky at the University of Hawaii. WHO IS DR JASON WRIGHT? Dr Wright is an associate professor of astronomy and astrophysics at Penn State University. Dr Wright achieved global fame after suggesting that the dimming of star KIC 8462852, also known as Tabby’s Star, could be caused by an alien megastructure called a Dyson Sphere. This is a hypothetical structure that could be used by an advanced alien race to harness the energy of a star. First proposed by theoretical physicist Freeman Dyson in 1960, the sphere would be a swarm of satellites that surrounds a star. They could be an enclosed shell, or spacecraft spread out to gather its energy – known as a Dyson swarm. If such structures do exist, they would emit huge amounts of noticeable infrared radiation back on Earth. But as of yet, such a structure has not been detected. Its amazing speed has led some experts to conclude it is the first such object to have come towards us from outside our solar system. Analysts also say its faintly red colour indicates it has been subjected to interstellar cosmic radiation which is harsher than we experience in our solar system. The fact that it doesn’t seem to have engines or show signs of propulsion may wreck the interplanetary-spacecraft theory. If a radio signal does come back from the object, Professor Avi Loeb, Professor of Astronomy at Harvard University, suggests that we will need to proceed with caution. Speaking to MailOnline, he said: ‘My recommendation, as in any dialogue, is that we first listen and do our best to understand what we are hearing. ‘Once we figure this out, we can decide how to respond. ‘Overall, I am an optimist. I believe that a very intelligent civilisation will be peaceful, and we could save ourselves millions or billions of years by learning from it. But this comet appears to orbit at an angle, and doesn’t circle the sun.